For months, Trevor and I have been enjoying the bounty of tomatoes from the garden in every way imaginable. (Steve doesn't like tomatoes, which is inconceivable to me). While we're technically over a month into fall, our tomato plants are producing as if we were still in the peak of summer. They'll wind down soon, I'm sure, but in the meantime we're enjoying the daily harvest. I've mentioned before that no one in our family especially likes bread heels, so I keep them in the freezer until I build up a big enough supply to make croutons or bread pudding. 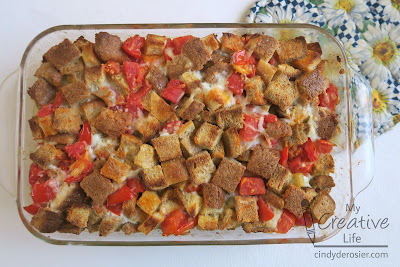 This time, I decided to experiment with a savory bread pudding that incorporated tomatoes. As I started adding ingredients, I realized I was actually making a baked, cheese-laden version of panzanella. I served it with garlic-infused olive oil, basil from the garden, and even more cheese and it was fabulous. Use a piece of wax paper to spread the butter on the bottom and sides of a 13" x 9" pan. 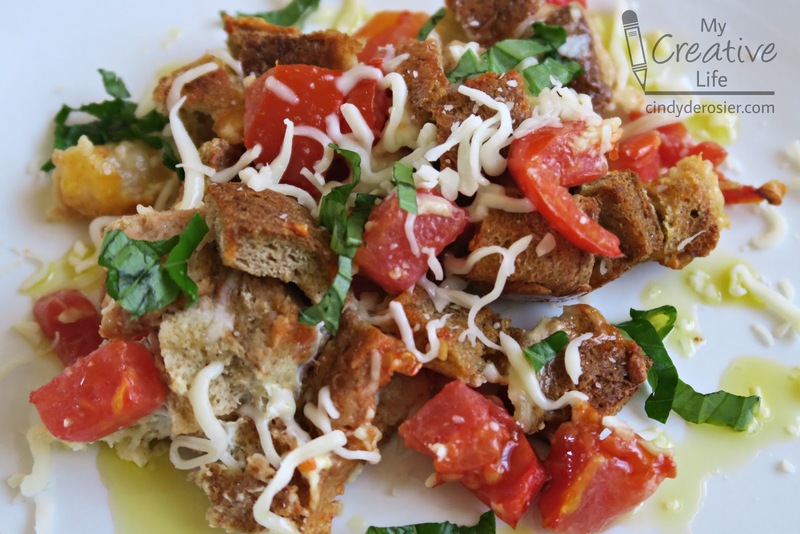 In a large bowl, combine the bread cubes, tomatoes, and most of the cheese. Stir gently, then transfer the mixture to the pan. Whisk the milk and eggs together. Pour the liquid evenly over the bread and let it sit for 15 minutes. Meanwhile, combine the minced garlic and the olive oil into a small dish. After the bread has completely absorbed the liquid, bake the panzanella at 400°F. for approximately 30 minutes. Let stand for 5 minutes. To serve, spoon a portion of hot panzanella onto a plate, then drizzle the garlic-infused oil generously over the top. Sprinkle with the remaining cheese, then garnish with shredded basil. Delicious!